You’ve probably heard of soluble fiber and insoluble fiber, but there is a third type of fiber known as resistant starch. Resistant starch is as close to a miracle starch as it gets (and beans have a lot of resistant starch!) Considered a functional fiber, resistant starch actually resists digestion, meaning the calories in resistant starch are much less likely than the calories in other foods to be stored as fat. And because resistant starches such as those found in the foods listed in Chart 1 below are only partially digested yet are even more filling than simple starches like sugar and flour (which are completely digested), you end up with lower blood sugar levels, fewer insulin spikes, and a better ability to burn fat after a resistant starch–rich meal. In other words, you feel like you’ve eaten more due to the taste and volume satisfaction resistant starch brings, but your body treats these foods as if you’ve eaten less because only a small portion of the food is metabolized. If your body needs more energy than can be absorbed from the resistant starch it has no choice but to burn fat! All of this is a perfect example of how not all calories are created equal. But back to resistant starch… this stuff is very bulky, so it takes up a lot of space in your digestive system and you simply feel more satisfied after eating. By promoting a sensation of fullness or satiety, improving your body’s sensitivity to insulin, and increasing the breakdown of fat, resistant starch from beans and other plant-based whole carbs (see Table 1 below) is an essential component to losing weight without feeling hungry. Not only will resistant starch help you shed pounds (which will reduce inflammation) but it can improve your health in many additional ways. Resistant starch helps heart health by binding to dietary cholesterol and removing it from the body, thus lowering serum (blood) cholesterol levels. Diets rich in resistant starch also help remove toxins from your body and can lower the risk for colon cancer. And, finally, because resistant starch is a prebiotic fiber that pro­motes good bacteria and suppresses bad bacteria, it can help normalize bowel function and support a healthy digestive system in general. Having more good-for-you bacteria in your digestive system will also improve your immune function and make it easier for your body to fight disease. For health and weight management it is a good idea to make sure you eat foods rich in resistant starch (such as beans!) every day. Beans and legumes are just about the very best source of resistant starch and fiber on the planet. In fact, nearly half of the starch in beans comes from resistant starch, meaning the starch is not digested, thus making beans an incredibly powerful weight-loss ally. A Canadian study of 1,475 men and women found that those who consumed beans regularly tended to weigh less and have a smaller waist circumference than those who did not eat them. The regular bean eaters were also 23 percent less likely to become overweight over time. (3) Bean eaters weighed, on average, 7 pounds less and had slimmer waists than their bean-avoiding counterparts, yet they consumed 199 calories more per day if they were adults and an incred­ible 335 calories more per day if they were teenagers. It is important to note here that, as mentioned earlier and as we discuss in detail in our Clean Cuisine book, all calories are not equal. Fiber calories and resistant starch calories do not contribute to weight gain. Also, some foods increase cellular metabolism and encourage increased energy burn to a greater extent than do others. It is very possible to eat more calories yet still lose weight so long as you choose the right foods. And for numerous reasons, the fiber found in beans is a super important health-promoting and detoxifying nutrient. In general, the more fiber you can get from whole foods (not supplements!) the better. 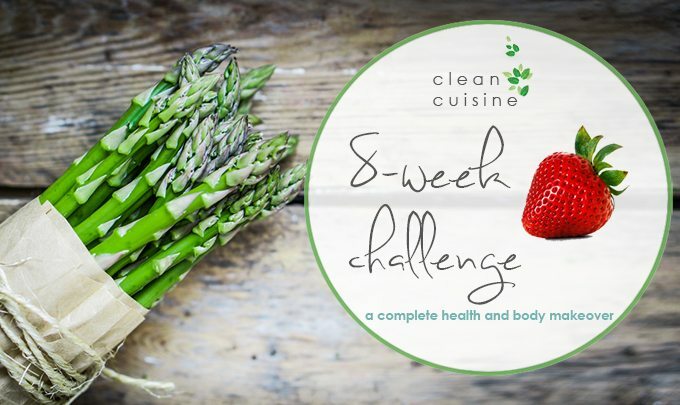 Although you will certainly be getting plenty of fiber eating fruits and vegetables on our Clean Cuisine Challenge, adding just ½ cup of beans or legumes to your diet daily will dramatically boost your fiber profile by approximately 8 grams. The National Cancer Insti­tute recommends at least 25 grams of fiber a day; we believe you should eat a lot more fiber than that, but 25 grams is a good start. Not only will beans slim your waist, they also slow aging. Beans and legumes are truly a fountain of youth food, bursting with anti-aging antioxidants and phytonutrients as well as a nutritional storehouse of vitamins and minerals such as folate, iron, potassium, and ultra-clean plant protein. Like all plant foods, each bean and legume has its own unique nutritional, antioxidant, and phytonutrient profile. So don’t play favorites. All you need to know is that all beans and all legumes are healthful. That old catchy rhyme that starts out “Beans, beans, they’re good for your heart” also rings true. The resistant starch in beans can bind to cho­lesterol and other fats in your colon for removal. Regular bean consump­tion has been linked with reduced homocysteine levels (elevated homocysteine levels are associated with heart attack, stroke and blood clots) and lowered blood pressure. It comes as no surprise that eating beans regularly reduces the risk of heart disease. In a large study of almost 10,000 men and women in the United States, those who ate beans and legumes four or more times a week had a 22 percent lower risk of coronary heart disease and an 11 percent lower risk of cardiovascular events than those who ate them less than once a week. This heart health benefit was independent of other health habits. What are the Healthiest Beans? Lentils, black beans, adzuki beans, cannellini beans, navy beans, white beans, red kidney beans, garbanzo beans, pinto beans, and black-eyed peas are all highly healthful. Every single bean and legume has something special to offer. There is no such thing as the “healthiest bean.” So try to mix it up and eat a wide variety every week. Have You Eaten Your Beans Today? The 2012 edition of the Dietary Guidelines for Americans developed by the U.S. Department of Health and Human Services (USDHHS) and the U.S. Department of Agriculture (USDA) recommends 3 cups of legumes per week, which comes to approximately ½ cup of beans per day. We think that is an excellent goal to strive for and we recommend everyone eats at least ½ cup of beans or legumes per day. Scatter beans on top of your daily salad. Why not eat them for breakfast? That’s what Ivy’s grandfa­ther, Earl Ingram, did every day for over 50 years. Grandpa Earl lived to be 97, maybe he was onto something? Use them in soups. 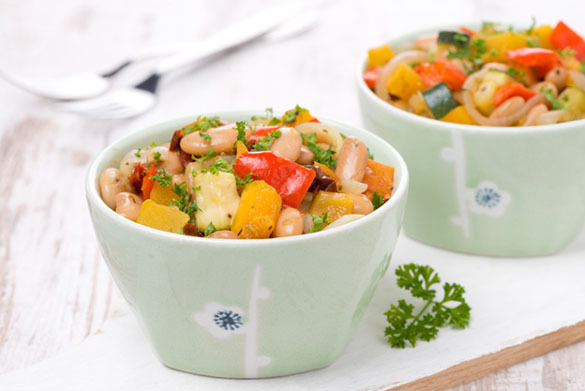 Ivy especially loves to purée beans in veggie-based soups to create a rich and creamy texture. We use our slow cooker for making split pea soup but also for many other bean and legume recipes. Eat more hummus. Just about any bean or legume can be made into an incredible hummus (try Ivy’s No-Oil Edamame Avocado Hummus recipe). Try bean-based burritos. We spread beans on sprouted whole grain tortillas or between sprouted corn tortillas for meat-free Monday night dinners. Try Ivy’s Garbanzo Bean Bread Triangles as an alternative to bread. Try Ivy’s Gluten-Free Pizza Made with Beans. Make bean burgers instead of meat burgers. Here’s a recipe for the Best Black Bean Burger Ever. Eat falafels! Give these Baked Falafels a try. Bring this 7-Layer Salad to your next potluck party. Make Spiced Indian Lentil Dal for dinner. Give refried beans another chance! Pacific Natural Foods manufactures delicious organic vegetarian refried beans that are very low in oil. We could go on and on with ideas for how to use beans and bean-based recipes and we have plenty more in our Clean Cuisine book, but the point is there are plenty of amazing bean cuisine dishes you can make! Canned beans rank right up there with fruits as one of the best “fast foods” on the planet! However, we do think it is important to look for brands that use BPA-free cans (such as Eden Foods). Although more research needs to be done, BPA has been linked to health problems in humans and the National Toxicology Program has reported possible effects on brain and prostate development in young children and fetuses. We try to avoid BPA as much as possible. An alarming study in the Journal of the American Medical Association showed there was a whopping 1,221 percent increase in BPA levels among sub­jects who consumed canned soup (canned foods are a big source of BPA) for five straight days. Fortunately, levels dropped to nor­mal when subjects switched to fresh soup. Oh! And to get rid of the “tin can” taste just do what chefs do, rinse your beans with water and drain well. C. L. Bodinham, G. S. Frost, and M. D. Robertson, “Acute Ingestion of Resistant Starch Reduces Food Intake in Healthy Adults,” British Journal of Nutrition 103, no. 6 (2010): 917–22. T. Colin Campbell and Thomas M. Campbell, The China Study (BenBella Books, Dallas, 2006). Y. Papanikolaou and V. L. Fulgoni, “Bean Consumption Is Associated with Greater Nutrient Intake, Reduced Systolic Blood Pressure, Lower Body Weight, and a Smaller Waist Circumference in Adults: Results from the National Health and Nutrition Examination Survey 1999–2002,” Journal of the American College of Nutrition 27, no. 5 (2008): 569–76.